Periculum in mora – Open Data Aha! 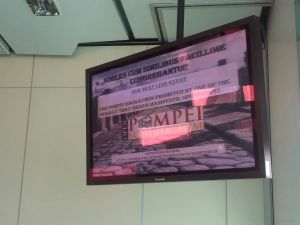 As we have already told you, OpenPompei has taken part in the Computer Applications and Quantitative Methods in Archaeology (CAA) Annual Conference and, as desired, we met many “open archaeologists” to involve in SCRIPTORIVM. But especially we took part in the presentation of MODA, the Italian Manifesto of Archaeological Open Data. We want to support the rising archaeological community interested in opening and sharing data beyond our project’ end. We believe that OpenPompei is like an enzyma that can accelerate the building of a new management of Cultural Heritage based (also) on Open Data. So, as the name of the CAA Annual Conference recited, “keep the revolution going”! The Manifesto could be the first step in this direction! #epicfail? Has Open Source in Archeology failed? This is the provocative title of Mappa Project speech in ArcheFOSS session, in which it tries to answer this question: why in the last years the impact of Open Source in Archaeology has been so limited? Two main reasons can be identified. MODA is a declaration of intent about the right of open access to archaeological data of entire citizenship. All archaeological remains are part of humanity’s legacy. As such, they belong to all of us, together with the information connected to. It was born by a group of archaeologists from different backgrounds and arose from the experience of the first Open School of Archaeological Data, promoted by the MAPPA Lab of the University of Pisa in July 2014. Everyone worked in different places, studied in different Universities, but all agreed about creating and sharing data in open format. Another opportunity to broaden and strengthen the rising archaeological community was the STVDIVM, promoted by OpenPompei project. Educational meetings such as these, promote the birth of a community of practice, that is a network of informal communication, linking a group of archaeologists working and learning together. Since October 29, 2014, 130 people have signed the Manifesto and also the following projects (besides OpenPompei): Wikimedia Italia, Mappa Project, Archeo ed Arte 3D – La Sapienza. Why are Open Data so important in Archaeology? Forty years of stratigraphic excavations have produced thousands, billions of data. Data-harvesting have an expansive cost. So, why do not we re-use data? Through use and re-use of Archaeological Data, we will able to make really cost- effective our data-harvesting, optimizing production costs. These practical considerations must be added to another one: opening and sharing Open Data generates a virtuous circle. By this one, both scientific community and citizens as a whole can benefit. We believe that in this way Archaeology regain a strong social relevance as a public service. This is an Italian pilot project, but the instance of opening and sharing the raw data could be an instance of all european archaeologists. Every country have a different situation about attitude, laws and management of archaeological information. But the goal could be the same: reinforced our research-methodology in order to enhance historical landscape preservation. This rising open archaeological community will meet again at SCRIPTORIVM. The participation of MODA’ members at this event is purposeful: we will go from theory to practice of ha(r)ckeology starting from a site of symbolic value as Pompeii!